Addressing BJP workers in Andhra Pradesh through video-conference, Modi also invoked "Telugu pride", alleging that Naidu betrayed Telugu Desam Party (TDP) founder N T Rama Rao by going with Congress. AMARAVATI: Prime Minister Narendra Modi Sunday accused Andhra Pradesh Chief Minister N Chandrababu Naidu of pushing the state into "sunset" to see his "son rise", a mock reference to the state's tagline "Sunrise AP". 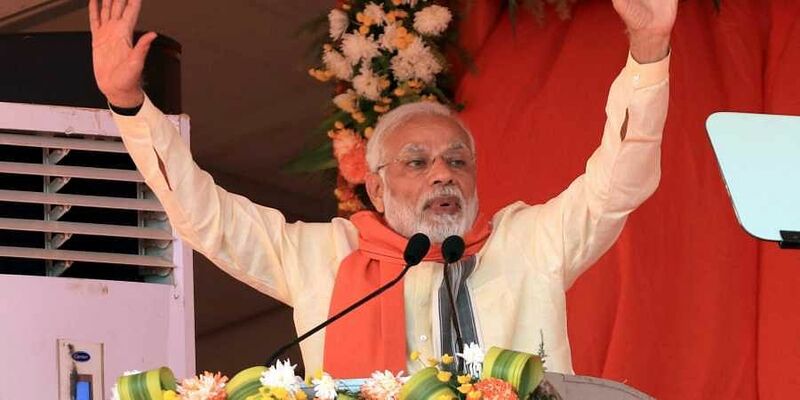 Addressing BJP workers in Andhra Pradesh through video-conference, Modi also invoked "Telugu pride", alleging that Naidu betrayed Telugu Desam Party (TDP) founder N T Rama Rao by joining hands with the Congress. "Telugu pride can only be restored when you (Naidu) put the interests of AP above your political interests and lust for power," the prime minister said. "A true tribute to NTR (the late N T Rama Rao) and what he stood for would be voting out those who betrayed NTR's values and sullied his memory. NTR's dream of a Swarna Andhra Pradesh will only be realised when every citizen of AP enjoys the fruits of development and not just one family," Modi said. Calling NTR a "true icon of Telugu pride", Modi recalled that it was NTR who led a "Congress-mukt Bharat" movement by forming an anti-Congress National Front. "Today, his own son-in-law (Chandrababu Naidu) has bent his head before the Congress to save his power. NTR was true icon of Telugu pride. NTR never forgave Congress for hurting Telugu pride and its betrayal of Telugu interests," the prime minister said. "Today, those in power in AP are so desperate to save their power that they betrayed Telugu interests and stabbed NTR in the back for the second time," he said. He also wondered how Telugu pride would be served by neglecting people and sacrificing their interests for power. "How is Telugu pride served by lying and abusing Modi day in and day out, just because you are worried that you will lose power? How is Telugu pride served by daydreaming about becoming prime minister when you have failed as CM?" Modi said, hitting out at Naidu. Accusing Naidu of being "fixated" with the rise of his own son, Modi said the chief minister did not realise how his policies and alleged corruption could lead to "sunset" for the state. "To set the 'son', he is creating an atmosphere for the sunset of the state. In only promoting his son, he has forgotten about other sons and daughters of AP," the PM said. The TDP walked out of the BJP-led NDA last year over the issue of financial assistance for Andhra Pradesh.